With close to 700,000 members, Suncoast Credit Union is the largest credit union in Florida. It’s also a leading company in sustainable building practices including development of six zero energy (ZE) bank branches. ZE buildings are energy-efficient commercial and residential properties that consume only as much energy as is generated onsite through clean, renewable resources. Today, Suncoast is extending its impact by sharing the sustainability ethic with the customers and communities it serves. Suncoast’s focus on community, environment, and sustainability goes back to 2008, when company leadership began exploring how they could improve their branches. They soon came to realize the huge impact they could have on the local environment and communities by retrofitting older credit union branches and constructing new energy-efficient ones. It began with small initiatives, like partnering with the Arbor Day Foundation and recycling, but Suncoast then began to look at their own buildings as a way to further their sustainability and environmental goals. “In 2013, we started looking at what could be done to save energy with our buildings,” said Bakari C. Kennedy, Director of Facilities, Energy Efficiency Engineer and Sustainability Specialist for Suncoast Credit Union. The ensuing work included lighting upgrades, installation of hybrid HVAC systems, advanced metering systems and solar retrofits. Today, of Suncoast’s 65 branches, nearly 95% of their portfolio of buildings have some measures to save energy, with the first wholly solar-powered branch opening in Fort Meyers in 2013. In all, 13 of those buildings have installed solar arrays, and about half are achieving zero energy performance. “We are proud to provide the advantages of a strong credit union to our 42,887 members in Fort Myers,” said Kevin Johnson, CEO at Suncoast Credit Union. “These new efficient buildings make it more convenient for current and prospective members to experience our lower rates on loans, our wide range of free services and our community outreach. “We’re currently building a 108,000-square-foot new administration building in Tampa scheduled to open in November 2018,” explained Kennedy. “It will have a 400-kW solar array and other smart technologies that we’ve used at our branches. It will be one of the most advanced, energy-efficient buildings here in the state,” he said. Kennedy says their aim is to be a carbon-neutral company by lowering their overall energy use and carbon footprint. 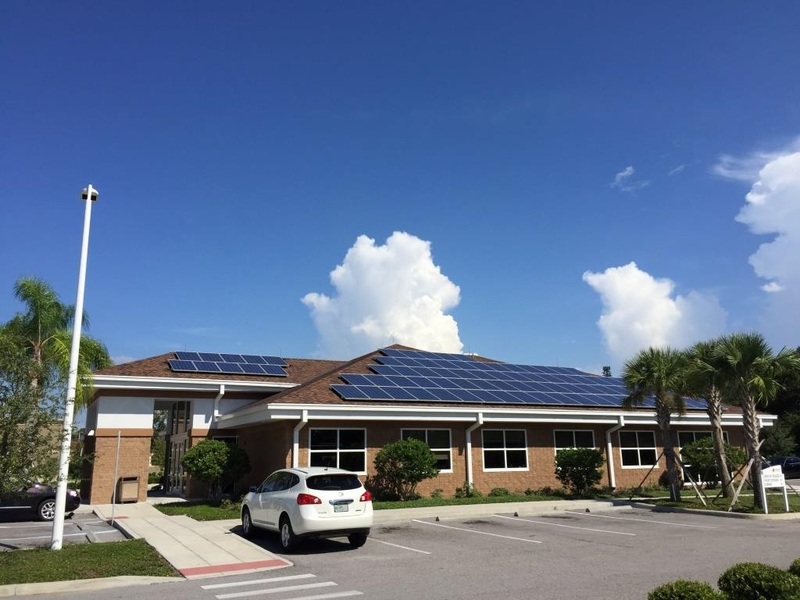 Perhaps even more importantly, Suncoast showcases these projects locally, including to commercial and residential members, to illustrate how they too can lower expenses by saving energy. “It could be our local barber shop, the owner of a fast food restaurant, or local church members. They’re seeing from our examples that you can make smart energy choices that really cut energy costs,” said Kennedy. Suncoast also offers a Green Auto Loan. “Rates begin as low as 2.5% when you finance an electric vehicle or a green vehicle with a combined EPA rating of 28 MPG or greater. We also offer Home Improvement Signature loans, Home Improvement secure loans, and Home Equity Loans to make minor or major energy upgrades,” adds Kennedy. Branches typically save about $1,500 dollars per month on electric bills over conventional design and operations—totaling about $300,000 dollars annually. The return on energy saving technology investments is somewhere between seven to 10 years, depending on the actual property and the systems installed, according to Kennedy. “More importantly as a financial institution it is a fantastic way to reach out to our members. It’s great for our members to use solar in their homes and businesses, and it’s a great way to help employ our members that live here,” he added. “Our goal is to help our members become truly literate about their personal finances,” added Johnson.